What inspired the formation of Gompa - Tibetan Monastery Services? Over recent years the senior lamas at the major monasteries and nunneries have been thinking about how their monasteries and nunneries could create a closer connection with their followers and friends around the world. It was this aspiration by the senior lamas that led to the formation of Gompa as a not-for-profit partnership of charitable organisations and inspired the cooperative building of online services throughout the Tibetan monasteries and nunneries of India and Nepal. Please see the About us page for further detail. What happens to the funds that are sent to Gompa - Tibetan Monastery Services? The sponsorships and donations received by the monasteries and nunneries go towards the day-to-day support of the monks and nuns; towards the development of educational and scholarly research resources available in each monastery and nunnery; and towards the support of each monastery and nunnery's local community programs, which include: community hospitals, care for the elderly, orphanages, community schools, and eco-technology programs. As a not-for-profit partnership of charitable organisations, Gompa keeps its operating costs to a minimum and sets its requested member support donations and fees for services as low as possible, based on the requirement to sustainably provide, develop and expand the online services over the long term. Any additional revenue generated through member-supporter contributions and the provision of services is donated towards the development of multimedia educational resources, in support of the partner monasteries and nunneries in India and Nepal; and towards the archival conservation of, and provision of access to classical Tibetan knowledge and arts study resources for scholars, students and the Sangha worldwide. Please see the About us page for further detail. Are payments made on the Gompa website secure? Yes - we do not see or store any card details as these details are entered directly into our payment provider's secure system. The payment provider's gateway is fully PCI DSS compliant and our acquirer for card payments is SIX Payment Services in Switzerland, one of Europe's largest and most respected card transaction processors. You can check your device and browser details at https://supportdetails.com. We can accept online payments by credit card (Visa, MasterCard, JCB, Diners) or debit card (Maestro, V PAY, VISA debit). For payments of GBP £500 or more you may choose to make your payments by credit or debit card, or by bank transfer. Please contact us for wiring details if you wish to make a payment by bank transfer. If I have any problems when using the services, is there someone who can help me? Yes - our tri-lingual staff (English, Chinese, Tibetan) are available to assist you. Please see the Contact us page for details. How can I be added to the Gompa mailing list? How do I unsubscribe or re subscribe to Gompa mailings? Please refer to the Contact us page for information about receiving email announcements from Gompa. Does Gompa protect my personal information? I've recently joined Gompa as a member-supporter. How do I view webcasts for free? As an active member-supporter you can register for Special Events for free (webcast fees are waived). Simply register as normal for each event webcast you wish to view. In case you have already registered for an event prior to becoming a member-supporter, but not yet made payment, you can cancel that unpaid event registration and then register again for the event; any webcast fee will be waived. What are the different booking and media options for sponsored prayers and pujas? For those monastery and nunnery partners indicated as offering media options, you can choose to view webcasts or photos of your requested prayer or puja at the time you make your booking request. If you would like to watch your sponsored prayers and pujas online as a webcast (available to view for a minimum of 14 days following the conclusion of the prayer/puja) then choose Webcast video. If you would like the option of both watching the webcast online and also downloading the webcast video(s) to your own computer to watch anytime in the future then choose Webcast video + download-to-own HD video. Alternatively, if you would like to view and download photographs of your sponsored prayers and pujas then choose Photos. If you do not require either video or photos of your sponsored prayers and pujas then choose No media. A certificate of performance from the monastery or nunnery (digital and printable) will be provided for all sponsored prayers and pujas. Can I invite friends and family to view the photos and videos from prayers and pujas that I sponsor? Yes - you can go to your sponsorship under 'My Sponsorships / Events' and select the button labelled 'View media or invite guests to view media'. From there you can send invitations to up to 10 email addresses. These invitation emails will enable your family and friends to view the photos and videos of your sponsored prayers and pujas. We require that all invited guests agree to Gompa's Terms and Conditions regarding the appropriate use of these photos and videos. How do I download webcast videos of sponsored prayers and pujas? Are the webcasts of sponsored prayers and pujas available for live (real-time) viewing, as they occur? All webcast videos are recorded live and uploaded to our servers several hours later. Once the webcast videos are uploaded, they are available for on-demand viewing at whatever time is convenient for you and your invited guests. How long will the photos and webcast videos remain available online for viewing / downloading? Webcast videos of sponsored prayers and pujas will generally be available for viewing online for a minimum of 14 days following the conclusion of the prayer/puja. Photos will generally be available online for 30 days. Are the webcasts of Special Events (including public teachings by senior lamas) available for live viewing, as they occur? Webcasts of Special Events are recorded live and, in most cases, are available for viewing later the same day. After the webcast of a Special Event becomes available it can be viewed at any time of your choosing until the webcast expiration date listed for the event. Can I view the webcasts on any computer or mobile device? Mobile devices (Android, Apple) are able to view the webcast videos. On older mobile devices the high-definition (720p) video might not be viewable but standard and lower resolution versions of the videos should be viewable. When viewing the videos on a mobile device, certain functions of the video player might be disabled. On some Android devices you might need to first select the full screen option of your player. If you wish to see how the webcast will play on your computer or mobile device, please select Test Webcast. Are there technical limitations to viewing the webcasts? What about a slow or limited internet connection? Online viewing of the webcasts has been extensively tested on various computers and mobile devices but is subject to certain limitations. 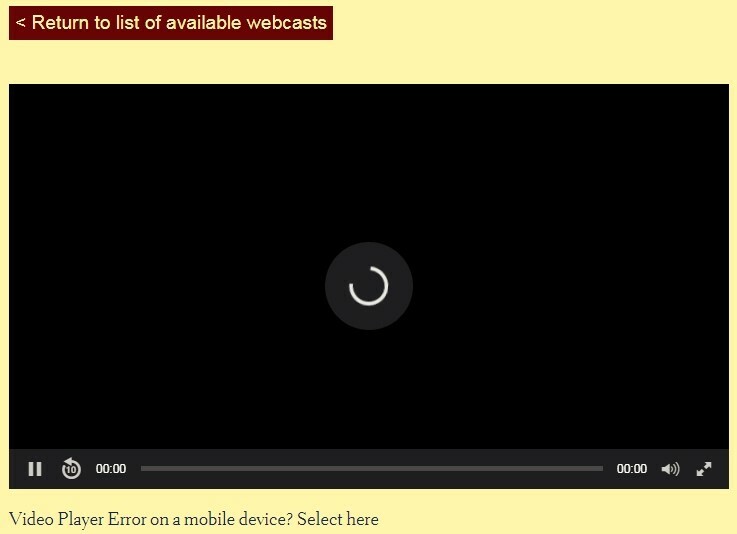 If you have a very slow internet connection you may experience some difficulties viewing the streaming (on-demand) webcast videos. We provide three different resolutions of each webcast session to support a wide range of devices and internet connection speeds. You can check your connection speed at http://www.speedtest.net. For webcasts of Special Events, there is an 'Auto' setting in the video player (located on the HD icon) that will adaptively stream the video at whatever resolution your device and internet connection can handle. Alternatively, you may select any of the three resolutions. If you wish to test how the webcast will play on your device, please select Test Webcast. What if I have problems viewing a webcast? When starting to watch a webcast video, please wait for the video to load. This might take up to two minutes, depending on your location and internet connection. and then choose again the webcast session you wish to view. this usually indicates that your antivirus or firewall protection is blocking access to the webcast. To check this, try disabling your antivirus/firewall temporarily and then try again to view the webcast as described above. On a Mac computer, if you experience problems or limitations when using Safari (for example, no choice of which video resolution to view), you can try using Chrome for viewing the webcasts. In case you experience difficulties viewing any webcast our staff is available to assist you (please see the Contact us page).